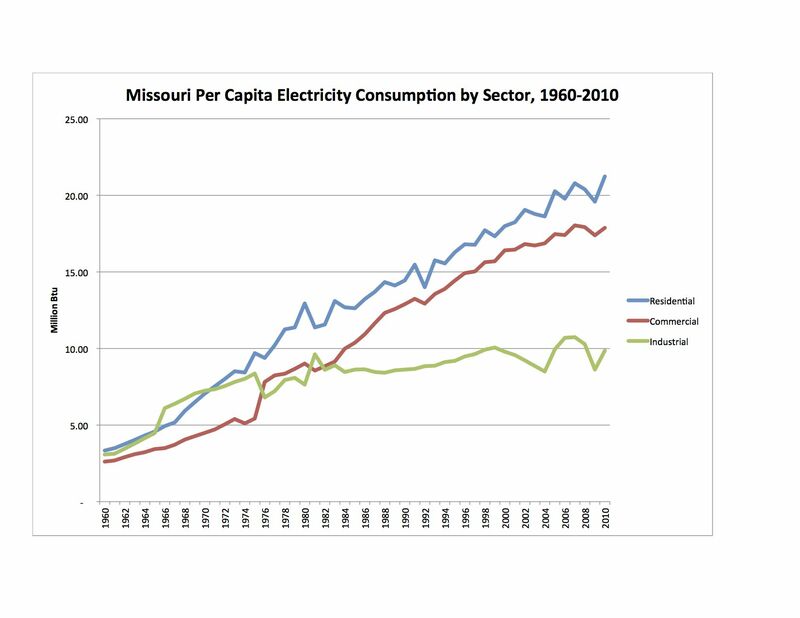 This is the 8th in a series of posts on energy consumption in Missouri. I have compared Missouri energy consumption to four surrounding states, and I have reported energy consumption by source in total, on a per capita basis, and on a per unit of Gross State Product basis. In my last post, I reported total energy consumption by sector. For a list of all previous posts, see here. Missouri’s population grew from 4,326,000 to 5,996,231 between 1960 and 2010. Thus, even if every person in Missouri used the same amount of energy, total consumption would grow. The graphs at right shows Missouri energy consumption by sector on a per capita basis. The first one shows the data with electricity considered as a separate sector. The dark blue line at the top represents consumption of electricity. Per person consumption of electricity has grown rapidly: in 2010 the average Missourian used 5 1/2 times as much electricity as in 1960. Starting out as the fourth largest sector per capita in 1960, it has grown to be the largest, more than 50% larger than the second largest. 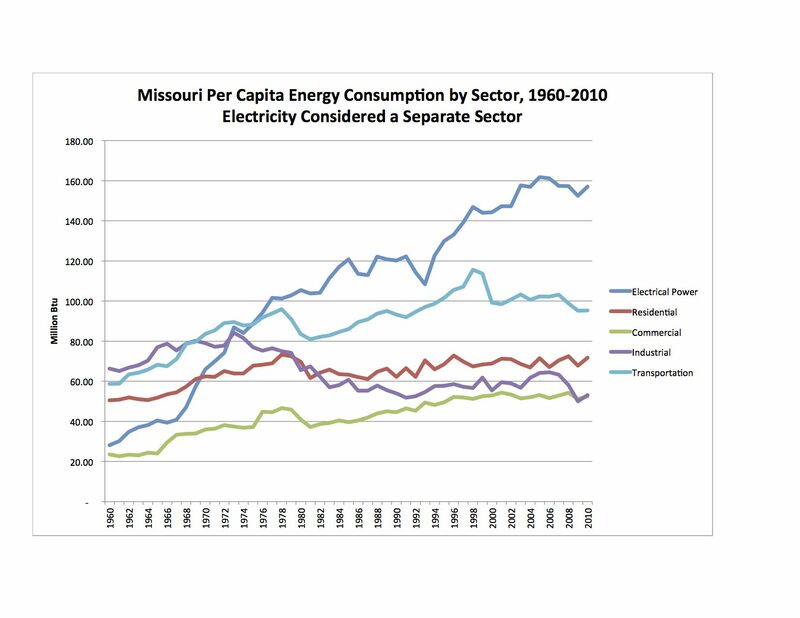 The second graph on the right shows Missouri per capita energy consumption by sector with electrical power considered as a source that is consumed in the other four sectors. The Purple line represents transportation, the blue line represents residential, the green line represents industrial, and the red line represents commercial. This graph reveals that transportation is the sector in which Missourian’s consume the most energy, narrowly edging out residential. Over the period, residential consumption grew 73% while transportation consumption grew 63%. Commercial energy consumption grew the most over the period, growing by 169%. Only industrial energy consumption declined over the period, by 9%. 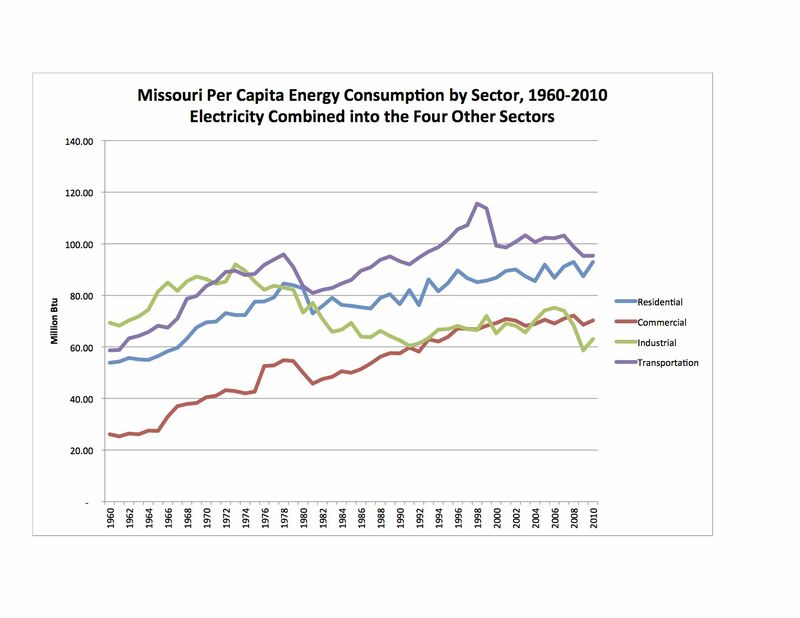 The third graph at right shows Missouri electricity consumption from 1960-2010 by sector. The transportation sector is not a significant consumer of electricity and has been omitted. The graph shows that industrial consumption has more than tripled since 1960. However, its growth rate has been nothing compared to the growth rate in the residential and commercial sectors, where electricity consumption is more than six times what it was in 1960. In my next post, I will report on energy consumption by sector per unit of GSP. For energy consumption: The data for this post is not found on a single source. It was pieced together from data available at the State Energy Data System(SEDS): 1960-2010 (Complete), Missouri State Profile and Energy Estimates, Energy Information Administration, http://www.eia.gov/state/seds/seds-data-complete.cfm?sid=MO#Consumption. For population: Historical Data, Census Bureau, http://www.census.gov/popest/data/historical/index.html. For gasoline prices: Fact #741: August 20,2012, Historical Gasoline Prices, 1929-2011, Vehicle Technologies Office, Department of Energy, http://www1.eere.energy.gov/vehiclesandfuels/facts/2012_fotw741.html. By mogreenstats in Energy on 2013/06/17 .